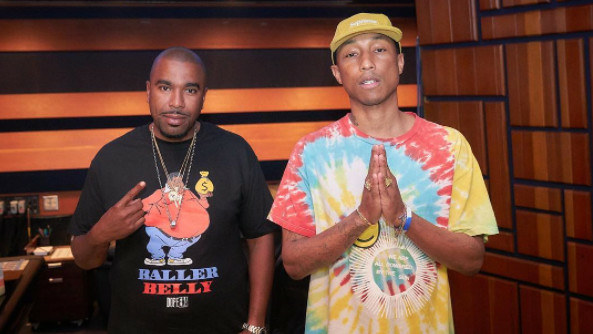 As their previous collaborations can attest, N.O.R.E. and Pharrell definitely have chemistry when it comes to cookin' up something nice in the studio together. The Queens hip-hop legend and Drink Champs host re-connected with the Grammy Award-winning producer back in June and now their latest collaborative track, an inevitable summer banger titled "Uno Más," has officially been released via Mass Appeal records. The feel-good song has us hanging onto summer as long as we can, with N.O.R.E. himself exclaiming his gratitude for the new track and experience alike, citing the new single as the favorite record he's made in the past two decades. "Made my favorite record I ever made in 20 years I can't thank this guy Enuff," N.O.R.E. captioned a photo of him and Skateboard P earlier this summer. "The best producer of all times I saw him make magic for 20 years n he still making s--t sound like heaven thx Sk8brd." While their first collaboration dates back to the late 90s when the Neptunes lent their production talents to a handful of early tracks in N.O.R.E. 's catalog, including 1998's "Superthug," the pair last joined forces in 2013, for N.O.R.E. 's album Student of the Game. Take a look at the animated lyric video accompanying "Uno Más" below.